The conquest system, a curse for some, a blessing for others. For Indra Makkar it was a new beginning. A young man teetering on the edge of suicide was granted a new life as a user when the system befell earth. Indra Makkar newly known as Genesis took refuge in the very place he ran away from, the Shaolin monastery. In this new world where dungeons descended from the sky and monsters roamed the earth Genesis would begin anew. 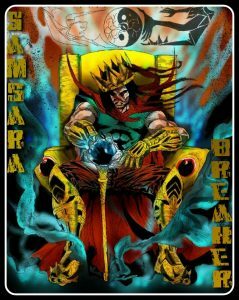 With his new class, Samsara Breaker, and his new name, Genesis he would train, fight and conquer. He would cultivate his talent for as long as it took, rising from the darkest depths of himself to become what even some who would call themselves immortal couldn’t achieve, what even those who were worshipped as gods among men couldn’t claim. Freedom. He would do so not with any weapon, no swords, no spears but three things.